‘The Bearsville Retreat’ is made up of two tree-ringed houses, set in a charming compound, in the peaceful hamlet of Bearsville. Built in 1937 by a local artisan farmer, the houses are newly renovated and furnished in a relaxed, modern-lodge style, with art throughout. The property is set back from the road next to an old-world farm and fully fenced, great for kids and pets. Both houses have access to a heated, saltwater, in-ground 20 x 40 Pool and Hot Tub. The houses are centrally heated and also have cozy fireplaces with firewood and kindling provided. The location is perfectly private without being isolated, only 2 miles from Woodstock Village Green. You can spend all day through to night in the restful grounds or go into town for dinner or drinks. No car needed if you want to come up from the city, you can walk to dinner and bike to the village. 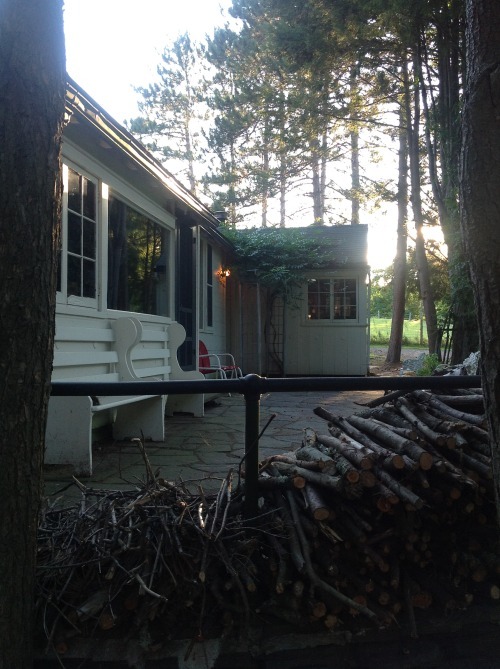 The bus drops you in Bearsville at the post office with a short walk to the Retreat. Ideal for all four seasons. The perfect, cozy base to enjoy stunning leaf color in fall, winter skiing at the regions three premier mountain resorts, hiking & biking in the spring and lazy summer days by the pool.